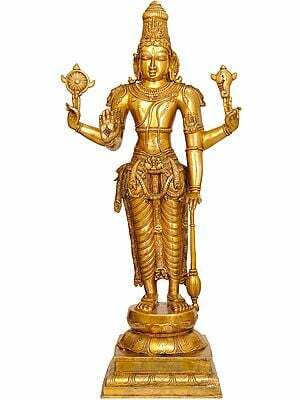 This brass statue represents in a queer contrast, Lord Vishnu's Vishva-roop, a manifestation of the great lord that includes in it the entire cosmos, or a form of which the cosmos is only a magnification. The ancient thinkers discovered that diversities define the creation, but an inherent unity threads it into a single unified whole. The Indian theology hence perceived God's unanimity in His diverse manifestations, each representing this, or that aspect of cosmic existence, though primarily the three, the creation, the sustenance and the dissolution, the first manifesting in Brahma, the second in Vishnu and the third in Shiva. While this Trio defines God's diversified manifestation, the Vishva-roop presents the spiritual perception of His unanimity. 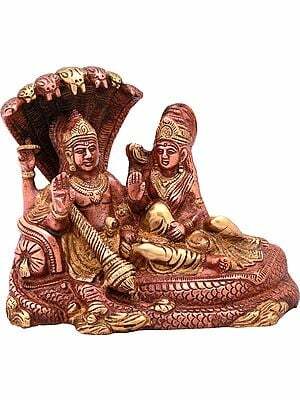 After the Creation has been accomplished, Brahma loses his relevance and remains no more a part of the spiritual vision and hence does not have the Vishva-roop. Shiva, as Sadashiva, is himself the cosmos, or the Creation is only his extension. Hence, in his context Vishva-roop has no relevance. 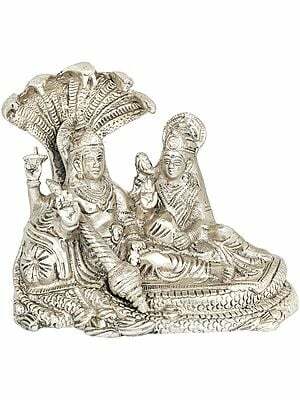 It is only Vishnu who needs cosmic magnification as it is only in him that the creation sustains and prevails. It is thus only Vishnu, or his incarnations, who has been perceived in Vishva-roop. 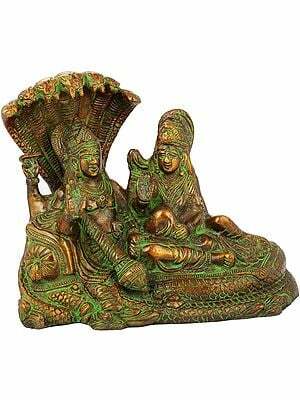 The central figure in this excellent statue is a representation of Vishnu. The towering crown, the Vaishnava tilaka on forehead, the Srivatsa mark on his chest, the large garland of Parijata flowers, lavish ornamentation and chakra, or the disc, gada, or the mace, lotus and conch like attributes in hands, are characteristic features of the iconography of Lord Vishnu. The seven-hooded mythical serpent Shesh, or Adishesh, which has its hoods unfurling above the head of Lord Vishnu like a canopy and its tail part coiling behind him, is his all time companion. 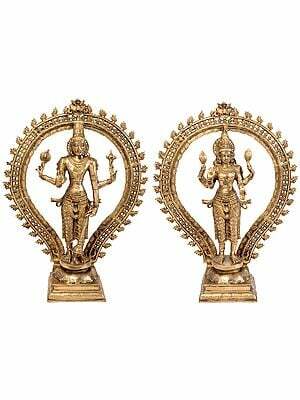 Cast in khadagasana, the most usual posture of his icon, Lord Vishnu has around his shoulders his usual sash and his adhovastra, a dhoti, tied with a rich lavish girdle and overlaid with ornaments of gold suspending from it. He has been cast with eighteen arms, all carrying in them weapons and attributes, which the convention assigns to him and other gods. If he is carrying the trident and the rabbit of Shiva and the khadag, or the sword of Kali, he is also carrying the battle-axe and the broken tusk of Ganesh. One of his hands is held in abhaya. 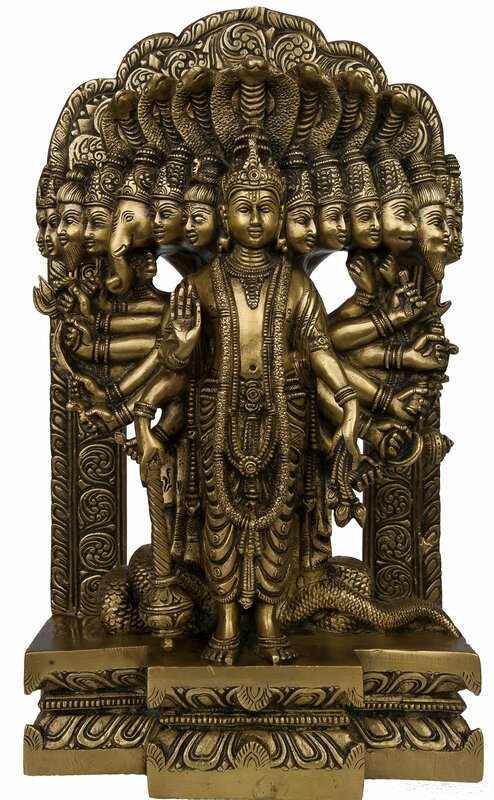 He has seven heads flanking on each of his left and right. Each of them has a distinct character and representative form of one of the gods, some symbolising divinity and others elements of cosmos. 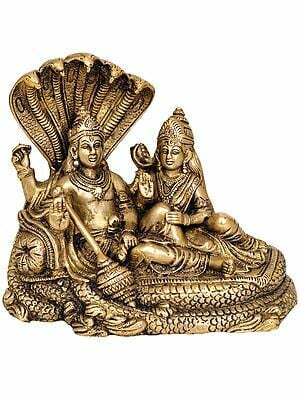 These gods include primarily Shiva, Brahma, Ganesh, Hanuman, Indra, Agni, Sun, Moon, Maruta, Kubera, Varuna and Yama and Brahma's three sons. 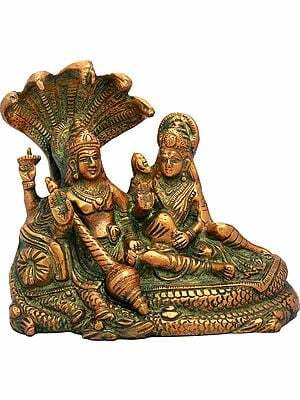 With Shiva and Brahma Vishnu forms the Gods-Trio, the timeless existence. Ganesh and Hanuman represent the timeless tradition of faith and the divinity which enshrines in all created beings, whether men or animals. Agni represents life, energy and vitality, Maruta, the wind-god, space, Indra rains and cosmic balance, Yama, the immeasurable time, Varuna the ocean, oceanic wealth and water, Kubera all prosperity and riches, cycle of Sun and Moon the decay, death and dissolution as also all vegetation and life and Brahma's three sons the entire mankind. 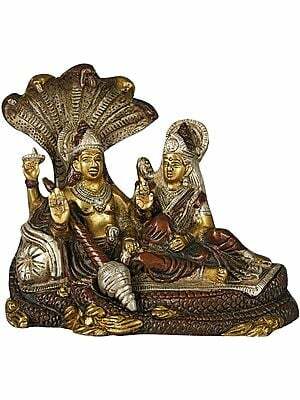 Conjointly they constitute the cosmos and appended with Lord Vishnu they effect his cosmic magnification. The image is contained within a prabhavali, the fire-arch, which it fully pervades. In Indian tradition, fire-arch symbolizes cosmos. This further strengthens deity's cosmic extension. Minuteness of details and finess of carving is beyond words, which one may appreciate with one's own eyes.